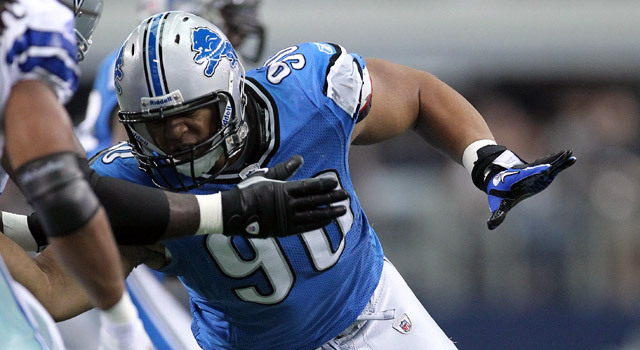 Published: Aug. 15, 2011 at 01:38 p.m.
Nobody is going to push around the Lions this season, at least if Suh has something to say about it. The first week of NFL preseason is nearly in the books. After a summer of discontent, it was a welcome relief. Even if the games do not count, just having football back made things seem a little better. Here is the thing, though. Do not go overboard about what you see out here in the preseason. You donât want to be the guy who watches a quarter of preseason football, and then jumps to draft Santana Moss in the third round of your fantasy draft, or thinks that you can build you fantasy team around Cam Newton. Let Bucky Brooks do that. 6. Jim Harbaugh is over Alex Smith, too. Bringing in Daunte Culpepper for a workout is the latest indignity for Smith, who heard it from 49ers fans during the Saints game. Hey, what happened to all of those guys who said Smith was going to benefit from having Harbaugh? 5. Is it all Peyton Manning? The Colts fans got a look at what a post-Manning era would look like and it was rather frightening. Here is a question, though: why is a team with a veteran quarterback coming off neck surgery backing him up with Curtis Painter, Nate Davis and Dan Orlovsky? Does Bill Polian really want to prove that Manning is the whole team? 4. The Bears make their own rules. The Bears do not care much for the new kickoff rules, and thumbed their noses at the league by kicking the ball off from the 30, rather than the 35. Hopefully this starts a new revolt in not only the NFL, but other sports leagues as well. Imagine the Lakers and Celtics dismissing the referees and deciding to call their own fouls? That would be awesome. 3. The Bears also hate Jay Cutler. The Bears were just a game away from the Super Bowl last year. The only thing holding them back was a shoddy offensive line. So how did the Bears respond in the offseason? By allowing their center to walk away as a free agent. You could tell this weekend, as the Bears gave up nine sacks in the first week of preseason. Jay Cutler is not going to make it through the year. 2. Packers play their starters. The Patriots drew my ire by keeping Tom Brady on the bench during the preseason, sticking it to the fans. The Packers let their No. 12, Aaron Rodgers, on the field this weekend and he turned out just fine. Which proves that the Packers love America. And their fans. As for the Patriots, Bill Belichick must love the attention that he gets for some of his moves. Was Ndamukong Suh a little excessive with his hit on the Bengals Andy Dalton? Perhaps. Should kids not follow that example? Of course. But while it might have been a little bit of a cheap shot, the Lions need this kind of edge about them. The Lions need to get testy. Just adding black to your uniform does not make you tough, but Suh putting the fear in quarterbacks could give this team an edge that it has not had in a long, long time. Rank really wanted to talk about Alberto Del Rio's big win, but you can talk to him about that via Twitter or via Facebook. Be sure to catch the latest on the Dave Dameshek Football Program. "Put a jersey on as we look at best sideline s..."